the “speakers”, presenting the arguments for and against, are both male. the “moderator” (who frames the issue, provides commentary on both speakers’ arguments, and “will peruse all correspondence from the floor and raise points that are of particular interest or merit with the two speakers”) is also male. Things are even more extreme in the “age” dimension — in a comment in the debate, I asked whether there were plans to involve any current or recent students as guest participants. And although it’s much harder to infer reliably from photos and language, there appears to be even more extreme marginalization in the race dimension … it’s a mighty white-looking bunch of folks they’ve got. In our reconception, the proposition and the opposition are each represented by individual speakers—experts in their fields chosen by The Economist‘s staff to match the proposition at hand. Because, after all, we wouldn’t want those (nudge-nudge) other perspectives to get equal standings with the guys hand-picked by The Economist’s staff. Posted by jon on Friday, January 18th, 2008, at 6:39 pm, and filed under political, social computing. I brought up the “who’s not here” issues various times during the debate; and along with several other commenters brought up questions of access and the digital divide. Nobody with official standing in the debate — pro, con, or Economist — responded. And returning back into the rest of the world, social networks can also make a huge positive impact on some underlying issues in the education field. Start with the exclusion and marginalization of a lot of voices and from debates held in the halls of power. Again use this debate as an example: no current or recent students in The Economist’s roster; the speakers, Moderator, and guest participants all currently occupy positions of (relative) privilege; and the tone is often condescending towards practitioners (as opposed to “experts”). Social networking technologies make it easier to broaden the conversation, with people bringing their friends and acquaintances in environments that are more inclusive – and creating opportunities to network together, creating connections among existing networks that didn’t exist before. The digital divide is clearly not between poor and rich, the haves and have-nots, the intelligent and the less-so. It’s about those who choose to interact with others and those who do not see the point of such connections and interactions. Well, yeah, actually there is a huge and very clear digital divide between poor and rich and haves and have-nots. It just doesn’t look that way when you’re one of the haves. Also, back on the gender front: it turns out that only one of the guest participants was on the front page at once, so it was always three guys and one woman up there. And not only weren’t there any links to the guests who weren’t currently on the front page — I couldn’t even find their statements via Google. So by the end of the debate there were 1000-word, polished statements from men … and only one from a woman (Nancy Willard’s, which along with Parry Aftab’s opening guest statement I thought was the best of the show). And it’s even more alarming when you look at the trends: down from 25% (at the beginning) to 10% (at the end). The final summary page does have links to all the guest speakers’ posts. It also includes links to three email messages from the moderator, which brings the ratio to 14 long posts by men, four by women or 22%. In Ewan’s thread, Vicki Edwards noted that few practictioners were included in the debate, and also asked where the students were. In a thread on CoolCatTeacher, she brings up the same issue with the “eLearn 2008 predictions”. Especially at the primary and secondary level, teaching is a female-dominated discipline. Hard to know how much the gender bias contributes to the marginalization of teachers; clearly, though, marginalization of teachers reinforces gender bias. The same’s likely to be true for other marginalized groups (parents, students) and other dimensions of bias (class, race, geography, …). In sociology, the term “matrix of oppression” refers to the intersections of different dimensions of social inequality — race, gender, etc. Race-related discussions of 2008 US presidential race provide concrete examples in the differing perspectives on statements [see below] by Michelle Obama, Geraldine Ferraro, Jeremiah White, and Bill O’Reilly in the women of color, black, feminist, and (largely white male-dominated) progressive and conservative blogospheres. Update, May 7: the panel didn’t get selected. Oh well. There was another great example of marginalization of women in The Economist’s recent article on Software Bugtraps: all fourteen of the people quoted in the article, including me, are guys. While at first blush this seems like a pretty accurate reflection of the composition of the companies the article focused on, it also really highlights how thoroughly some perspectives are marginalized in the field to date. This is particularly relevant in light of Laura Beckwith’s fascinating research into gender-related differences in debugging. In my blog post, I also managed to mention several other women who have might have something to say about the topic, and of course there are many more — typically not the usual suspects, which is why their viewpoints are so important. Update, November 18: The Wikipedia page on Gender HCI has a good overview of research in this area by Beckwith, her advisor Margaret Burnett Beckwith, and others. And of course, it’s not just The Economist. I was looking at the agenda for the Berkman@10 Conference at Harvard, “a chance to reflect critically on the last ten years of the development of the Internet and to look ahead to the crucial questions we face in the next ten years of cyberspace”. It’s a jam-packed two-day program, followed by a gala dinner and awards ceremony. Day 1 has “plenary sessions with big thinkers in the Internet field”; of the thirteen listed [counting the “Cluetrain” authors as four], twelve are guys. Day 2’s got one keynote, by Jonathan Zittrain. Guy. Day 2’s breakouts look great, and are much more diverse … but come on, talk about your second-class status. I wonder if they’ll be see this as a crucial question and reflect critically on it? Update, April 10: They’ve added another keynote, by Josh Marshall of Talking Points Memo. Guy. Don’t get me wrong, he’s a great choice; he’s done great work and has some really interesting things to say. The same’s true of Arianna Huffington, Pam Spalding, Melissa McEwan, Jill Filipovic, rikyrah, brownfemipower, blackamazon … the list goes on. Oh well. So much for the critical reflection. Via Concurring Opinions we learn that the Yale Information Society Project is hosting a Symposium on Reputation Economies in Cyberspace. Already notable for excluding women from its conferences, despite the fact that women are the majority of Internet users, the organizers managed to put together a list of 20 speakers, of which 16 seem to be male. This despite the obvious raft of gender issues related to this topic, see e.g. this, this, this and this just for starters. I’d like to say this was unbelievable, but unfortunately, it certainly isn’t. The few women they have speaking are absolutely fantastic, but sheesh, four panels, four women, one female speaker per panel – could that be any more tokenizing? And yes, I realize there is one female moderator, but if we add her to the count we have to add the three male moderators too, creating a ratio of 23 men to 5 women participating, or about 17%. So here is a suggestion for anyone putting together a big symposium on information politics, cultural policy, copyright, or media law for the fall: Dig a bit deeper in the scholarly literature. Judge people by the work they do and the ideas they contribute to the discussion rather than simply the number of Google hits or quotes in The New York Times. Such measures are self-fulfilling and ultimately stagnating. Hey, look at that, all guys! Mary Jo Foley cracks the list at 14; Kara Swisher, Jacqui Cheng, and Elinor Mills are the only other women in the top 25. And geez, three of the top five are from TechCrunch, how ’bout that! Reading the article, we see that “top” means “having the most Techmeme headlines” — a pretty limited definition of top, if you ask me, although it certainly helps to explain why people like danah boyd or Anil Dash who post less frequently and on a wider variety of topics (not all of which are of interest to TechMeme) aren’t there. Also note that the vast majority of the bloggers are from blogs with a certain focus (a Web 2.0/Silicon Valley slant) … is that really the universe of “tech bloggers”? More subtly, the majority of these blogs are generally what Susan C. Herring et. al. refer to in Women and children last: the discursive construction of Weblogs as “filter blogs”, commenting on external events, as opposed to “personal journals” or “knowledge blogs”; TechMeme’s technology is a natural for filter blogs, so it’s unsurprising that they’re overrepresented. As Michael Plater II points out, this metric also favors bloggers on sites like TechCrunch with higher visibility: “their content has a better chance of making a headline on Techmeme because of their site rather the post of someone on a smaller site saying something of even more insight.” His alternate list incorporating page views as well as number of headlines gives a very different picture in some ways, with Ionut Alex Chitu’s Google Operating System blog now at #1, and Duncan of TechCrunch dropping to 21. In other ways, though, it’s very similar: Kara Swisher is the only woman in the top 25. Women and young people are key actors in the history and present use of weblogs, yet that reality is masked by public discourses about blogging that privilege the activities of a subset of adult male bloggers. In engaging in the practices described in this essay, participants in such discourses do not appear to be seeking consciously to marginalize females and youth…. At the same time, by privileging filter blogs, public discourses about blogs implicitly evaluate the activities of adult males as more interesting, important and/or newsworthy than those of other blog authors. Update, December 1: memeorandum apparently uses the same underlying engine as Techmeme, and so I did a quick analysis after Cernig’s post on Newshoggers about Jack Schofield’s laudatory article in The Guardian. 90% or more of the credited articles were by guys; and of the headlines that mentioned people, 90% or more were about guys. On their leaderboard, the only two blogs by women I saw were Michelle Malkin and Meaghan Mcardle… hmmm…. December 3: Guess what? Automated news doesn’t quite work reports Gabe Rivera, author of Techmeme and memeorandum, announcing the hiring of a human editor — Megan McCarthy, formerly of Valleywag and (briefly) Wired. Gabe ‘s view on bias is straight out of “male privilege 101”: “Techmeme isn’t fair because life isn’t fair, and Techmeme will always be biased because humans have built Techmeme.” Try reading it with the more accurate “Techmeme isn’t fair to women … and will always be biased against women, because men have built Techmeme”. The “blurblog” on the right-hand side of Gabe’s post has enthusiastic quotes from Staci Kramer of paidContent.org and 19 men — 20, if you count Dave Winer’s mention of Robert Scoble. Staci’s last on the list. Marshall Kirkpatrick has more on Megain’s hiring at ReadWriteWeb’s JobWire, noting that Techmeme’s anti-woman and pro-Techcrunch bias have been repeatedly noticed. Funny how the guys writing about memeorandum overlooked this. 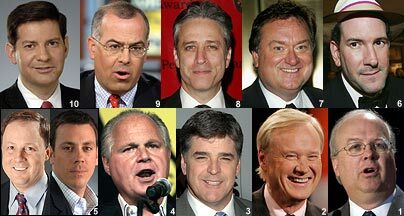 The ten most influential US political pundits, according to the Telegraph from the UK, via Echidne of the Snakes. See also A.J. Rossmiller’s Myth of the meritocracy (including Morgaine’s and my comments) and Kay Steiger’s The “new” new left is white, male. Paul Rosenberg blogged about the Telegraph list on OpenLeft in A List of 50 Top Pundits Illustrates Conservative Hegemony In Action , looking at it via a Gramscian lens and focusing on conservative hegemony. It’s a good post … but what’s interesting is that neither he nor any of the commenters mentioned the lack of diversity — particularly irritating in light of Chris Bowers recent Wow, we nominated the black guy paean to the Democratic party’s diversity. This points to a huge potential advantage for us in terms of the culture wars: a more balanced demographic mix of pundits is likely to be far broader in its appeal — and give the weathervane folks some additional options. Of course this lack of diversity isn’t restricted to conservatives…. It’s straight out of Freire: the oppressed recreating the conditions of oppression. Especially in light of the points Chris made in his equally-excellent Wow, we nominated the black guy, this is an important thing to be conscious of as progressives employ asymmetric methods to undermine and route around the hegemony. The criteria for the blogs was mostly based on Technarati authority, page impressions and Progressive/Liberal political content. This means generally the blogs chosen were the most-read blogs in each state. It wouldn’t surprise me to discover that women, Asians, Latinos, Native Americans, LGBTQ, rural, and military bloggers are also all severely underrepresented (and that’s just off the top of my head :-)), so it’s best to think of a holistic solution that increases their participation as well as blacks and bloggers living abroad. These metrics are going to tend to reflect existing conditions of oppression — it’s the “rich get richer” dynamics of the web as a whole, where the dynamics like wealth, available free time, differential media access, proximity to existing networks of power, and even the interaction between preferred blogging style and authority rankings factor in. See A.J. Rossmiller’s The myth of the meritocracy, blogophere edition and Susan Herring’s Women and Children Last for more (links above). In November, will the Democratic Party want votes only from those who visit the largest white blogs? Or will they want votes from minority communities that wouldn’t be caught dead visiting whitosphere blogs that are 98% white? Update, June 5: Minority blogger representation has been discussed in stories by Karen Brooks in the Dallas Morning News, Jose Antonio Vargas in the Washington Post, a roundup in the Atlanta Journal-Constitution, and most recently by Linda Kellen Biegel in the Anchorage Daily News, there’s still virtually no attention in the “progressive” blogosphere. Pam Spaulding’s crossposted “DNCC blog dustup continues” has two excellent discussions, on Pam’s House Blend and on Pandagon; the table in Francis L. Holland’s recent post clearly shows the severity of the problem. Then again, as The Municipalist points out, it’s also a great opportunity. Thus far, nobody’s talking about diversity in the age — how many 50+ bloggers, or blogs targeting primarily the 50+ crowd, are there? Seems like a key demographic for the Democrats this fall …. Anyhow, it’s all complex, and it’s not clear whether people are trying to solve it or hoping the problem goes away (which it won’t). We shall see. Wow out of all the experts, entrepreneurs, observers, VCs and coders in the b-list through z-list, you think you might have happened upon a woman. Yeah really. The author, Richi Jennings, responds “I hope it goes without saying that we had no “male-only” agenda, in the same way that we had no “positive discrimination” or “gender quota” agenda” and the managing editor Ian Lamont defensively chimes in with some equally lame defensiveness talking about two bloggers he would have liked to include on the list but didn’t. Some discussion ensued. Richi and Ian are by the way both credited as “Industry Players”. 1) One of the blogs does have female authors — didn’t you see this? 2) Three of the blogs have anonymous authors, whose gender is uncertain. As I have stated before, the fact that several authors are female and others are of unknown gender did not impact their inclusion in the list. Also, “Industry Players” refers to our participation in The Industry Standard’s Prediction Market, not a self-chosen blingy put-down to you or other readers. Why do you think that changes anything? The repeated pattern here almost-completely-male “most influential” lists…. Do you think there are influential women out there? If so, why didn’t you as Managing Editor give Richi feedback that the list wasn’t representative? I mentioned your self-descriptions as “Industry Players” because it really did seem relevant. First of all, in terms of gender and power: it’s an in-joke, hides information from casual readers (isn’t it more significant for us to know that you’re Managing Editor? ), and risks looking like a strutting self-aggrandizing sexist stereotype. Put that together with the aggressive declarations by you and Richi that there IS NOT an issue here, and it potentially starts to paint a picture. And like I said in the thread there, it’s also very relevant to the prediction market: with your current all-male connections, and an all-male staff, you seem at risk of having insufficient diversity to get accurate predictions. Do you think that in the aggregate women are more, or less, likely to want to participate in something run by a bunch of male “Industry Players”? By the way, also posting in the thread on Industry Standard: Shelley Powers, author of (amongst other things) the classics Guys don’t link and When we are needed, both from 2005. These problems aren’t new. Neither is the lack of awareness and response from most guys. Jon: You earlier accused me of “lame defensiveness” and also falsely claimed that we have a male-only agenda. I responded, and now my “lame defensiveness” has become an “aggressive declaration.” Which is it? Would it be better if I just imposed self-censorship? Regarding your claim: ‘The repeated pattern here almost-completely-male “most influential” lists’. My response: The “B-to-Z list” refers to the fact that they are not from the supposed “A list” promoted elsewhere. In other words, most of them are *not* influential. I’ll say it again: Gender was not a criterion. Women were included in the list. The “Industry Player” moniker: It’s programmed. Men, women, people with anonymous handles will have it appended to their comments, if they are registered to play in the predictions market. Many registered female players do have it appended to their comments, yet this is the first complaint I’ve heard about it. If you want to see my title, click my hyperlinked name on all of my titles. It’s all there. I’ve added it here, too, for your readers to see. But, to make it absolutely clear who I am, I will try to manually append my full name and title directly to the first new comment I make in a comment thread. Does that seem reasonable? I’ve spent time responding here, so I’d like to ask you a few questions: You clearly don’t like the list, so I’d like to hear from you who should be removed from the Standard’s B-to-Z list, and why, and who would you have take their place, and why? Thanks for your time in responding. Your suggestion that I falsely claimed you have a male-only agenda is a good example of what I see as simultaneous defensiveness and aggressiveness. You’re defending yourself against an accusation that wasn’t made; in fact, I excerpted Richi’s denial. Nobody has accusing either of you of this — in fact Jeneane replied in the other thread “the whole POINT is that you didn’t have a male-only agenda.” You’re also doing so aggressively, by calling me a liar (or at least that’s how I interpret “false claims”). As to what would be better, it’s what I said on your thread: to acknowledge the pattern of almost-completely male lists, and (if you see it as a problem) take some responsibility and start thinking about what can be done. > I’d like to hear from you who should be removed from the Standard’s B-to-Z list, and why, and who would you have take their place, and why? A few specific recommendations of excellent writers with views that often don’t get picked up or are trivialized in the broader tech blogosphere that leap to mind: danah boyd’s apophenia, Elizabeth Lane Lawley’s mamamusings, and Feminist Gamers… really, though, you’re the experts here, not me. A different way of looking at the situation is as an opportunity, not just in terms of gender, but other dimensions of diversity as well. If you take the initiatve of promoting a much more diverse set of blogs than the other lists, Industry Standard will naturally start to attract a more diverse set of readers and people linking to you. That in turn could lead to a much broader pool of people to your prediction markets, which all the empirical and theoretical works shows is absolutely vital. It’s great to hear that you’ve got a bunch of female players already, but given the defaults in the tech industry, it’s something that requires a lot of attention on an ongoing basis. PS: > The “Industry Player” moniker: It’s programmed. Obviously. Why did you decide to program it that way? Anyhow, I wasn’t complaining; I was just pointing out the impression that it risks creating — and the potential consequences for your prediction market. Are the statistics you’ve released on the number of players and bets broken down by gender? I do think that signing your title the first time you comment in each thread is a good approach. It’s true that it doesn’t take that much effort to discover it, but it’s pretty rare for people to click off the main thread before responding. The Industry Standard? Really, it’s still around? I don’t mean to be a troll or anything, but I honestly thought this publication had gone belly up sometime around 2001. And speaking as a woman who works in the periphery of the tech industry and the Internet space, I never found this magazine to be useful to me in any way. It just never spoke to me. Anonymous, it did go away back in 2001 … and it’s baaaaaack! : online-only, and with a new business model that involves advertising-based sponsorships — Intel is their launch sponsor. One of their biggest hits so far is their “where are they now” series on 90s dot-coms … good Slashdot thread, too. Great stuff: for example, the pets.com sock puppet became a mascot for a sub-prime lender! Perhaps the most groundbreaking aspect of the new Standard is the prediction market — a virtual proving grounds for the ideas discussed in the publication and elsewhere on the ‘Net. Populated by the community at large (which includes our contributors and advisory board members), the prediction market articulates the same emphasis on community knowledge and networking that is perhaps the Web 2.0 era’s most important contribution — the power of collective intelligence. Prediction markets have proven to be remarkably powerful tools for gauging events and trends, and we think that the addition of this technology to the site will provide a very special type of meaningful interaction. As James Surowiecki’s The Wisdom of Crowds and Scott Page’s The Difference both emphasize, diversity is vital for prediction markets. [Page’s book goes farther, and describes the situations under which diverse groups are likely to outperform experts … and even (remarkably) groups of experts.] Otherwise, things collapse into groupthink and an echo chamber. For those who are interested in doing their own analyses, the full text of the Industry Standard article is here. It seems to me that every name mentioned is male — the pseudonymous “Arthur” and “Mordaux” both describe themselves as “he” on Emergent Chaos. Ian pointed to Venture Hacks as a blog where females are involved, so I looked at it a little more. Their front page describes the team as Nivi, Naval, and Kartik — all guys, I think. The page starts with recent recommendations from Michael and Anand (recommending Ali), and then endorsements from Evan and James. Next there’s an article with a photo featuring Mike. In fact, I might have missed one or two, but I believe all of the 25-30 names mentioned on the front page are guys. People’s profiles are also revealing. The Mike who’s featured twice on the front page has “subscriptions” to Nivi, Rob, Paul, Reid, Evan, Tony, Marc, Josh, Mike, Josh, Michael, and Michael. Nivi is “recommended” by Naval, Ethan, Brian, Healy, Farbood, Drew, Jon, Pejman, John Philip, Jeff, Kurt, Marc, Mazen, Ryan, Kamal, Andrew, Andre, Matt, and Rahmin. Hmm. If you look hard enough there are indeed some women. On the “about” page, Betty Kayton’s the CFO, along with three Founders and two Advisors; the company’s “recommended” by Heather Gilchrist along with nine guys. On the Recommended page, maybe somewhere around 5-10% of the activity is by women. Oh baby. As with Ian, Richi, and the Industry Standard, I’m not suggesting that this reflects intentional bias on Venture Hacks’ part. Instead, because of existing power imbalances and connections, it’s the default behavior of networks that start with a bunch of techie guys and their networks. In Venture Hacks case, the result to date seems to be a bunch of guys discussing ideas with other guys, with a likely outcome of male entrepeneurs pitching ideas to male VCs. Gender and power in online discussions, chapter n+1. Update, 11 a.m.: I sent mail to the Venture Hacks founders asking whether they had also noticed this pattern, and if they saw it as a potential problem going forward. For some reason, Ian stopped replying to my mail or posts, and I never heard back from the Venture Hacks guys. I guess they don’t think it’s an important issue. Oh well. We’ll see how well the “all boys” strategy works for them. As the unsuccessful attempted “interventions” in the last few threads imply, after months of observing and blogging about the issue, I’m now trying to do something about it. Other examples include helpeing to organize a panel on “Hate and oppression in cyberspace” at Computers, Freedom, and Privacy, where Ann Bartow discussed some of these issues, and co-moderating a workshop session with moot of 4chan, for which I prepared an extensive resource page on Dealing with hate speech, flaming, and trolls. We propose that OpenLeft feature 5-7 guest bloggers each week, prioritizing diverse voices and perspectives not usually heard on the front page. OpenLeft front page posters will reciprocate, by blogging on the guests’ sites, and the combination will (with luck) create a temporary hub in the progressive blogosphere. The result is improved mutual understanding, links with other tightly-connected networks, and a base for more collaborative and effective strategic actions. However, if you don’t have a broad mix of backgrounds and perspectives — which includes the traditional diversity dimensions — then your cognitive diversity is typically limited. There was a great example of this in the age dimension in Matt’s “Tools as Generational Markers” thread, where almost nobody here talked about first-person experience with Facebook (and more generally were unable to relate to the high-schoolers’ experience that Matt talked about). That’ll make it really hard to accurately incorporate social network sites, and the audience of 60,000,000 Facebookers, in any of OpenLeft’s thinking about strategies…. So I think it’s important to pay attention to identity diversity as well as cognitive diversity. Fortunately It’s not an either-or thing; and the goal of the proposal is to help to address both. Update, June 21: three acceptances so far … from Pam’s House Blend, Jack and Jill Politics, and Orcinus! More here. The common thread is the attempt to intimidate me into shuttering Shakesville. It’s not just aggression, but a particular kind of aggression—a bullying, threatening, eliminationist kind of aggression. There’s another possible component to this, related to the internet generally. Women’s participation in general-audience internet communities tends to be very different from women’s participation in women-centered spaces, largely attributable to commenting policies and community rules that, even when there are guidelines re: hate speech, tend to turn a blind eye toward misogynistic slurs and female-specific harassment and silencing techniques. Commenters emphatically agree, and make a bunch of other excellent points. There’s been a surprising amount of coverage of diversity issues in the blogosphere in the mainstream media recently, in articles like Amy Alexander’s The Color Line Online in The Nation, Karen Jesella’s Blogging’s Glass Ceiling in the New York Times (which as nathanrudy pointed out on dKos was exiled to the Fashion and Style section). Newsflash to the netroots and the media (which seems perpetually confused on this issue): The netroots are not the base of the Democratic Party. Overwhelmingly white, male and highly educated, they’re a loud anomaly in a party that’s wholly dependent on the votes of African Americans, women and working-class whites. Since Get FISA Right was also mentioned in the article (although much to my relief, she confirmed in email that she didn’t think of us as ninnies), I posted about it on the on the Get FISA Right message boards. The responses are interesting, with two guys responding to the article by attacking Kirsten without addressing her points. The mutual guest-blogging project has taken some interesting turns. My summary so far in Mutual guest blogging: intermission and discussions is the most recent update; more soon. The mutual guest-blogging on OpenLeft story continues in Gender, race, age, and power in online discussions, chapter n +1 …. It also spawned a debate between me and Chris Bowers of OL about whether netroots non-diversity was a myth. Guess which positions we each took? Update, November 18: Matt Stoller eventually banned me from OpenLeft over a debate about the importance of social networks for activists — citing as his justification his jealousy over the amount of credit that Get FISA Right and I personally got. More context in Petitions are soooo 20th century. A good article, although focusing only on the extremely destructive version of trolling that certain people focus overlooks the damage of the far more pervasive trolling in the classic sense of the word. As well as discussions about Danielle’s work, and the gender issues related to trolling (recently covered in a Freakonomics blog post in the NY Times), it also would have bee nice to see something about community moderation and other defense techniques as an antidote. Moot, quoted in the article, co-moderated the CFP workshop session with me. Just last week Tech Evangelist Robert Scobel wrote a column about his favorite tech experts on Friend Feed. He featured everyone from Michael Arrington founder of TechCrunch to Steve Rubel, Director of Insights for Edelman Digital. Great choices, but sadly not a single woman made Scobel’s list. and then goes on to list ten influential women, including social capital expert Tara Hunt of Citizen Agency, Fast Company Director of Social Media Lynn Johnson,blogger Beth Kanter, and blogger/consultant Charlene Li (whose Groundswell is one of only two books written by women on Amazon’s top-10 business book list). A couple of the women on Allyson’s list are also in Saabira Chaudhuri’s Most Influential Women in Web 2.0 in Fast Company. Saabira’s article is very good as well; but what do you notice about this picture? While it’s always risky to infer race from photos and names, with the exception of Rashmi, this looks like a pretty white bunch to me. If there aren’t any influential black or Latina women in the web 2.0 space, who’s representing these perspectives — and who are the role models for younger black and Latina programmers? PS: Scoble’s all-male list is, I believe, also 90% white, with Jeremiah Owyang the only exception. Allyson’s list, by contrast, is much more diverse, with Sandy Jen joining Charlene, Rashmi, and Lynne. Update, November 30: Sexist, Sexist and More Sexist: Digg Responds to Fast Company’s Women in Web 2.0 and Why Sexist/Offensive Comments Online Should Not Be Tolerated, and Digg Bans 20-30 Users for Hate Speech In Response to Fast Company’s Women in Web 2.0 (an interview with Beth Murphy of digg), all on Saabira’s blog An Itinerant mind, continue the story. Lately there has been a strategic effort by women in tech to try and get more female panelists at tech conferences, confront misogynistic attitudes and thwart the perpetuation of the boys club in technology. The site highlights 13 “featured blog posts” on the home page at a time, and that selection is updated regularly. Extra! recorded those featured bylines twice every weekday for nine weeks and coded them by gender. * During the study period (7/7/08–9/5/08), only 255 of 1,125 bylines—23 percent—belonged to women. The Post does seem to be making a conscious effort to include women’s voices; despite the low percentages, the study found at least one female byline on the home page at all times. But if there is indeed such an effort, it stops far short of parity. Of the 89 times bylines were checked during the study, not once did the number of women’s bylines equal those belonging to men. Only eight times did women account for more than a third of all bylines. And Arianna Huffington, appearing 57 times, accounted for more than a fifth of all women’s bylines; 45 of those occupied the most visible top post. Only once, in fact, did a woman other than Arianna Huffington get her byline in the most visible top slot—Post editor-at-large Nora Ephron (8/26/08). Amusingly, back in June Chris Bowers used Huffington Post as a proof point for the netroots diversity in his The Myth Of The Non-Diverse Netroots on OpenLeft. Ooops. Jessica’s information looks mighty factual to me — and non-diverse, too. I have a feeling that my response piece is going to hold up better than Chris’. Inspired by Jen’s mention of “the perpetuation of the boys club”, I decided to go back and check on Venture Hacks. The dynamics I noted in June are still there. The front page starts with a “recent recommendations” from TJ (a guy), promoting his own company; and about Harper and Jacob (guys) joining a startup. Then there are the same old quotes about how great Venture Hacks is from Evan (guy) and James (guy). Four of the five tweets on their Twitter feed are quotes from guys (the fifth promoting an article on Venture Hacks). In fact there are once again at least 25 references to or videos of guys on the front page, and none at all to a woman. Founder Nivi’s subscriptions/subscribers are probably a reasonable approximation of the overall gender ratio on the site: 90-95% male. Horrible as that ratio is, it’s worth highlighting that the front page ratio is even worse. Nivi has now been recommended by 21 people, still all male. His recommendations do include two women along with a bunch o’ guys: his CFO Betty Kaplan and Marianne Liu: “My go-to real estate agent for startups. She helped us with Songbird’s search for office space.” Not an encouraging sign for the future that he’s already hired the only two women he’d recommend. Some good news for Venture Hacks: Charles River Ventures has recently signed up as the site’s first sponsor. The all-male CRV investment team will no doubt feel right at home. Oh, okay, since I’m in the mood … I went back to The Industry Standard as well. (Earlier discussion starts here.) At least nine of the ten “prediction experts” on the front page are guys (not sure about AM), and so are almost all of the “online users” (Mandy and potentially jame being the exceptions). Along with two posts by Cyndy Aleo-Carreira, ten of the twelve news posts are by guys. Cyndy’s also the only woman in Managing Editor Ian Lamont’s list of eleven “connections”. Well, at least that’s better than prediction leader Bradley Baker, whose 25 connections are all-male. Hmm. Maybe Charles River Ventures should consider an investment here. The new #topprog Twitter hashtag for progressives provided a great example of “Guys don’t link” behavior that I discuss in #topprog: #tcot, trolling and topics for #fem2.0. There’s been a lot of discussion about “culture wars” and how we might “end” them (see here, here, here, here, here, here, and here). I always found labeling things like abortion politics, gay rights, and evolution/creationism as “cultural” controversies is a way of trivializing them. It’s been interesting seeing you, Tim, Damon, Peter, Chris, Brian, Daniel, and Scott discuss abortion as a “culture war” issue. It’s really revealing that other than you in this post, nobody else bothered to include any women’s views. Update, Feb 3: Ed responded thoughtfully, and I continued the discussion. Via a tweet from Matt Yglesias, we noticed something odd about the new Washington Post Post Politics authors page. Out of 27 total columnists and reporters, three are black men and three are white women. The rest are white men. And if you don’t scroll past the fold, white men are all you see.